Austen Keating set up Dallas Stars prospect Tye Felhaber (6) on the power play for the game winner 10:15 into the third overtime, officially ending the fifth-longest game in OHL history as the Ottawa 67’s advanced to the Eastern Conference Championship Series for the first time since 2012. The 3-2 road win featured 58 saves from Vancouver Canucks prospect Michael DiPietro who locked up in a goaltending duel with Sudbury’s Ukko-Pekka Luukkonen who made 60 saves of his own. 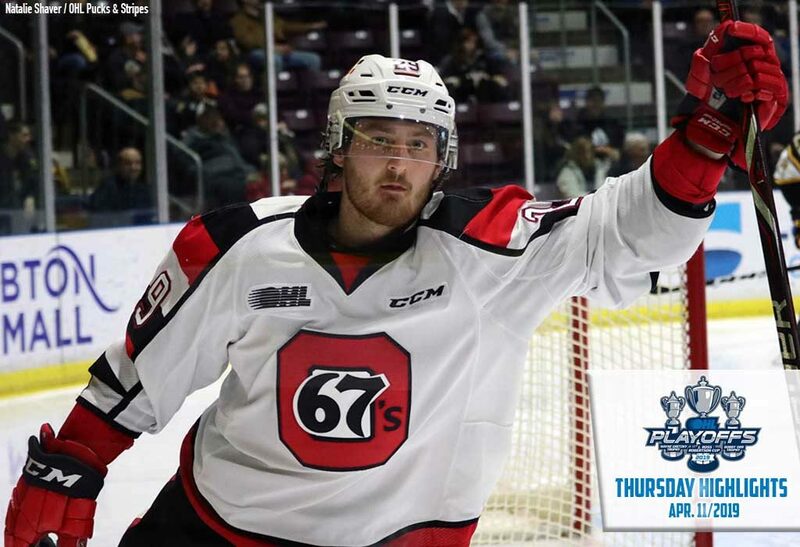 Mitchell Hoelscher (4) opened the scoring 4:19 into the third period before Kyle Maksimovich (5) drew the 67’s even at two 6:40 into the third period. 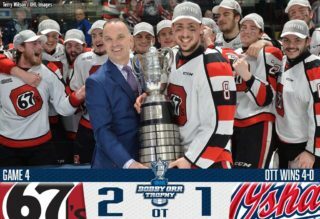 Adam Ruzicka (3) and Nolan Hutcheson (4) scored Sudbury goals as the Wolves gave the 67’s all they could handle before seeing their season come to an end. Shane Bulitka picked up a pair of assists for Sudbury as the Wolves were outshot 63-60 over 110 minutes of action. 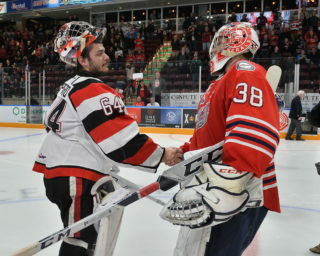 The game was the longest in franchise history for both the Wolves and 67’s. The Wolves reached the second round for the first time since 2013 following a 43-20-3-2 regular season. Ottawa awaits the winner of a series between the Niagara IceDogs and Oshawa Generals to determine their Conference Final opponent. The Oshawa Generals are right back in it, defeating visiting Niagara 7-3 on Thursday to tie their second round series at two wins apiece. 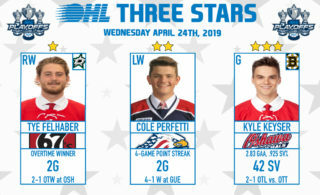 Nando Eggenberger (2, 3) and Anthony Salinitri (6, 7) each scored twice while captain Kyle MacLean (5) had a goal and an assist as Oshawa scored seven times on 26 shots while goaltender Kyle Keyser did his part, turning aside 36 for the win. Kyle Bollers and Serron Noel each had a pair of assists while Giovanni Vallati (1) and Allan McShane (4) also found the back of the net. Niagara managed to outshoot Oshawa 39-26 as Matthew Philip (1), Akil Thomas (3) and Jason Robertson (7) all lit the lamp. Oshawa was 3-for-7 on the power play while holding Niagara to 0-for-5 on the night. Things got chippy late in the game, setting the tone for what’s sure to be an intense Game 5 when the series shifts back to St. Catharines on Saturday night. 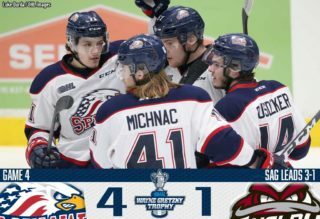 The Soo Greyhounds saw an early lead get away in Game 3 but dug deep in Game 4 on Thursday to defeat the Saginaw Spirit 3-0 and stay alive in the Western Conference semi-finals. Los Angeles Kings prospect Matthew Villalta stopped all 25 shots he faced while Jordan Sambrook (3), Keeghan Howdeshell (6) and Barrett Hayton (6) all scored goals as the Hounds outshot the visiting Spirit 29-25. Philadelphia Flyers prospect Morgan Frost picked up assists on all three goals while Jaden Peca had a pair of helpers. Saginaw’s Ivan Prosvetov made 26 saves in the loss as the Spirit were shutout for the first time all season. Saginaw looks to rebound at home in Game 5 on Friday for a chance to advance to the Western Conference Championship Series.